Want the playbook for building a scalable (and lovable) technical training program? Look no further than MongoDB. With more than 8,300 customers across 100+ countries and over 45 million downloads, MongoDB is the open source platform that was named the database developers most want to work with. Among many other things, MongoDB is renowned for its online training program, MongoDB University. The university offers certifications and free online courses to train developers and engineers to build with MongoDB. In 2018, MongoDB University announced a major milestone, having eclipsed over one million student registrations. We spoke with Shannon Bradshaw, MongoDB’s Vice President of Education, to learn more about the journey behind MongoDB University’s success. Founded in 2012 by a team of five, MongoDB University is now managed by a team of more than 20 and has seen rapid growth since its launch. “We started MongoDB University to make it as easy as possible to learn how to use MongoDB products and services anywhere in the world for free,” says Bradshaw. “A guiding principle of MongoDB is to get everything we can out of the way of developers so they can focus on building great apps.” One of the key areas that the team focused on was training. At the time of University’s launch, MongoDB already had a team dedicated to training customers. “But in-person training isn’t easily scalable or as flexible as some organizations require,” says Bradshaw. MongoDB chose to power their online learning program with Open edX, an open source platform for delivering online learning. This decision afforded the team the scalability and flexibility they needed to deliver high-quality MongoDB training. Contrary to what some might believe, Bradshaw reveals that the free training courses offered by MongoDB University did not cannibalize their paid training business. In fact, the free courses complemented and accelerated the demand for MongoDB’s paid offerings. Bradshaw shares that MongoDB University also serves as a relationship builder with the MongoDB community. The free online courses also serve as a feedback mechanism for the MongoDB team with their users. “Throughout a course, the learner is constantly interacting with us. We, in turn, are able to identify gaps in our course content and inform our future courses. A lot of conversation takes place, and that helps us contextualize our curriculum, making it easier for us to teach engineering teams how to integrate MongoDB with their existing toolset,” says Bradshaw. 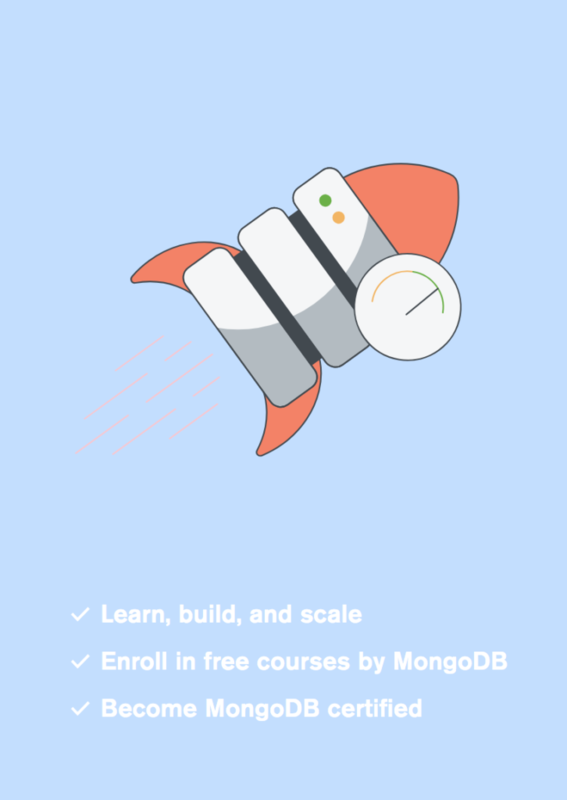 At its launch, MongoDB University began with one course for developers and one for operations engineers. Today, MongoDB offers 11 free courses plus two officially recognized certifications for learners to become a MongoDB Certified Developer or MongoDB Certified DBA. Bradshaw shares that in order to build a truly successful online-ed program, education teams need to take a content-first approach. “As long as you’re providing high-quality educational content, your learners will put up with hiccups in the user experience in order to learn. Focus on creating a great curriculum,” says Bradshaw.